Alameda Dental Care combines in-office treatment with take-home follow up care. 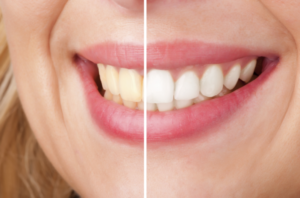 The in-house bleaching treatment consists of 2-4 treatments depending on the original shade of a patient’s teeth. Each treatment round lasts approximately 15 minutes and the service is completed in one office appointment. The Venus Max product contains a special ingredient to help limit sensitivity problems during treatment. Patients will see the improvement for themselves. Teeth can change multiple shade levels before the patient leaves the office. The Venus Pro whitening kit consists of custom trays that go home with the patient for continued treatment and follow-up care. The take home kits continue to limit sensitivity problems and are user-friendly. Refill kits are available for touch-ups every 6-12 months. In order to maintain your bright new smile, your dentist may also recommend avoiding certain foods and drinks in your daily diet. In addition to limiting coffee, tea, red wine and cola drinks, your dentist may also advise patient’s to quit smoking. Of course, regular teeth cleaning by a hygienist will also contribute to long-lasting results. During the months of March-June, Alameda Dental Care participate in a national fundraiser. During this time, 100% of their teeth whitening proceeds are donated to both local and global children’s charities. Find out what kind of teeth whitening treatment will work best for your personal goals. Our office will create the best treatment plan for your particular situation. Call Alameda Dental Care, 480-447-1906 today and schedule your initial consultation. It’s never too late to create a perfect smile!